Proteins are the building blocks of a body. From hair to nail, every cell requires protein. 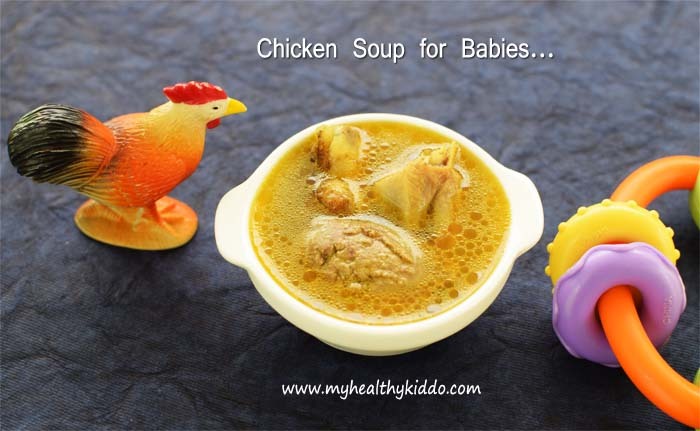 Chicken is highly recommended for children as it is the richest form of proteins. 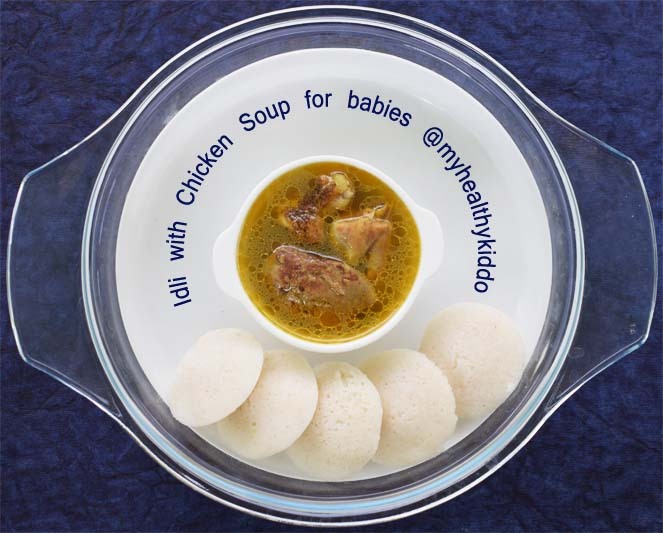 Do not opt for skinless chicken for kids as they needed fats too. 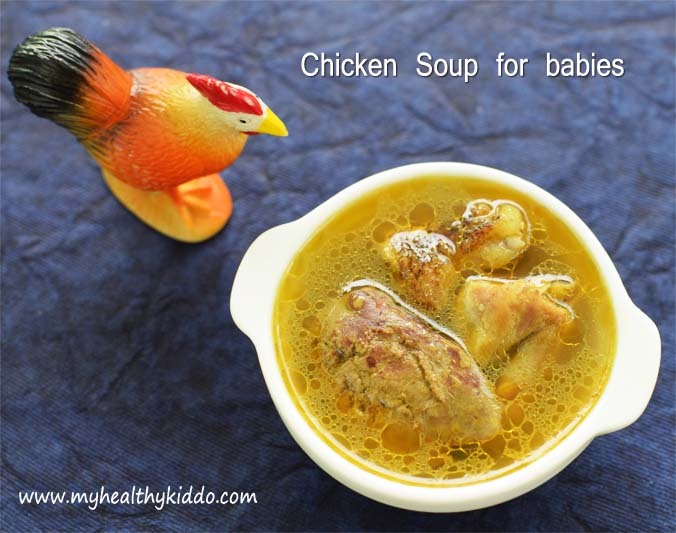 Soup is firstly recommended for babies before feeding flesh. Soup extracts the nutritions from the meat and the liquid form eases digestion. Do not skip sesame oil as it is used as a coolant to subside the heat generated by chicken. 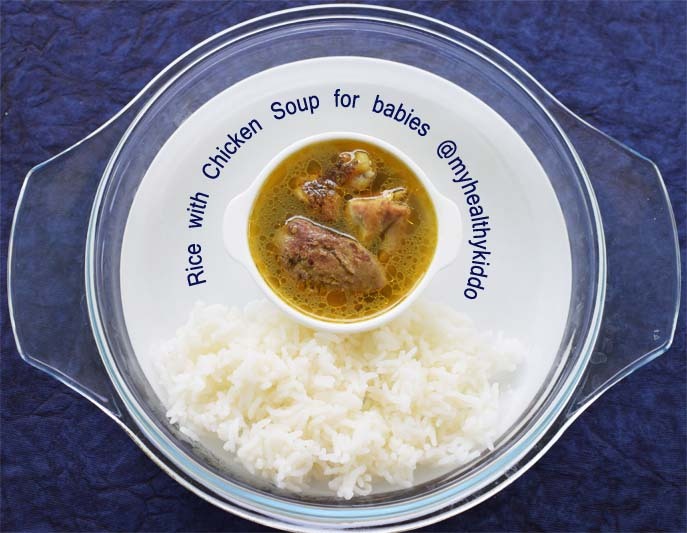 Traditionally, Chicken soup is prepared for Lactating moms every week when she and the baby have hair bath. As I repeatedly emphasize, do not get Broiler chicken if there is a threat for injected antibiotics in your country. Prefer naturally grown country-side chicken(Naatu kozhi). 1. Wash chicken twice in plain water and then soak it in water mixed with turmeric powder and few drops of lemon for 5 mins. Then again wash it twice in plain water. 2. In a pressure cooker, add chicken, turmeric powder and plain coriander powder. 3. Add few peppercorns, cumin and fennel seeds. 4. Add few coriander & curry leaves, chopped small onions, tomato, clove, cinnamon, crushed garlic and few drops of gingelly oil. 5. Add a cup of water and pressure cook for 8 whistles. I am not sure about broiler chicken. This whistle count is for country-side chicken. 6. Once cooked, drain out the soup to a bowl. Oily, frothy, healthy and aromatic soup is ready. Feed warm to the baby and you too have a sip with salt & pepper! Select chicken pieces with bones for the soup. The bones and the marrow add taste and nutrition to the soup. Once soup is extracted, you shall use the remaining chicken pieces in the curry prepared for adults. Remaining soup can be consumed by moms with an addition of salt. It tastes too good with idly. If prepared in the morning, you can use for breakfast and lunch. If prepared in the afternoon, you can use for lunch and dinner. Consume within the same day. Heat well before the second use. After 1 year of age, you shall add a piece of ginger and some salt before cooking. Slowly you can add a pinch of chilli powder too. The same preparation applies to Mutton soup as well. I’ll make this for my 6 year old daughter. Your recipes are good! It came out very well. My 8 month old son likes it very much. Thanks for posting it.